“Like a well-written mystery novel, a well-taught case makes extensive use of ignorance. Just as knowing the identity of the culprit deprives the mystery reader of the pleasure of figuring things out for himself, premature knowledge of the historical solution to case deprives the student of much of the benefit of engaging a problem that is entirely new to him. In particular, the student who knows real-world outcome of the decision loses both the motivation that comes from curiosity and the empathy that comes from engaging a problem from the necessarily prospective perspective of a real-world decision maker.” This is great advice from Bruce I. Gudmundsson in his latest blog “The Man Who Knew Too Much” on facilitating case studies. When facilitating cases we must be sure that those participating get the opportunity to figure things out themselves. We do this by giving those pieces of information that drive their thinking and questioning about the situation. This is the path that leads them to taking an interest in and exploring the situation fully as they interact; use their imagination and initiative to come up with solutions. Notice the word solutions if plural. We are looking for tactical options not the school solution. There is a profound difference in how they learn and retain the skills necessary in becoming more effective decision-makers. An example of this technique for police we used in the High Stress Tabletop: Training from the Neck Up program was The October 2nd 1987 shooting in Boston’s Back Bay by the infamous Ted Otsuki a career bank robber. Otsuki shot it out with four Boston Police officers fired shots at the officers, striking Sergei four times and injuring one other. Detective Roy Joseph Sergei, was Killed in the Line of Duty. You are in the position of the four officers responding to this call. At approximately 1 A.M., a female occupant of a third-floor apartment in the building began to scream, seeking protection from a male relative who then was beating her. A man in the public alley at that time heard the tenant's pleas, asked for her address, (371 Commonwealth Ave) and reported her complaint to the police. Officers one and two, on duty in a rapid response car, received the report and proceeded to the apartment building. Officers three and four heard the broadcast while patrolling the area and decided to respond as back-up support for Officers one and two. The four officers met at the entrance to the apartment building and rang the tenant's doorbell. The tenant spoke to the officers through her intercom and explained that the buzzer in her apartment which operated the front door was broken and she was afraid to leave her apartment to let them in because her relative was outside her door. At this point, Officers three and four went to the rear of the building in search of a back entrance. Officers one and two remained in the building foyer, ringing other doorbells and announcing their presence over the intercom. 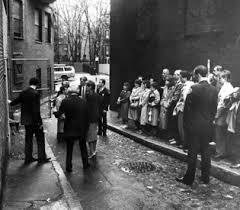 Once in the alley, Officers three and four observed an individual in the courtyard, against the wall of the building. Officer three shines his high intensity flashlight on the defendant and asked him what he was doing. The defendant responded, "I'm just hanging around." Officer three orders the defendant to climb over the fence, out of the courtyard and into the alley. Officer three then reported to Officers one and two by means of a portable radio that they had apprehended a suspect in the alley. The subject climbed over the fence as directed and, when he landed on the ground, attempted to walk away from the police officers. Officer three grabbed the defendant and told him to face the fence and put his hands up. Standing approximately one foot from him, Officer Three started to "pat down" the subject. Within seconds, the defendant shoved Officer Torres, took a semiautomatic pistol from underneath his jacket and began to fire. What now officers? Then set a TIME that puts pressure on them to make decisions. This class had 16 participants so I broke them up into two groups of 8 to work the scenario. Then they brief their solution and it’s critiqued as a class. During the briefing there are numerous critical questions that are asked that need to be answered for them to continue on their quest for solutions to the problem they are faced with. Just like in the real life scenario making progress requires going beyond any authoritative expertise to mobilize discovery, destroying certain entrenched ways, tolerating failure, and generating new ways to thrive in the climate of chaos and uncertainty. Here is where the true value of the facilitator comes into play. The facilitator’s preparation and knowledge of the case is crucial as the facilitator decides which questions he will and will not answer. The interaction that takes place is really pretty damn cool to see as the discussions become robust and dynamic as each group works collaboratively to find the answers they need to implement their courses of action. Every so often you come across participants who know the case. This is not a major problem when you are aware of it, because more often than not, it just rings a bell and they are familiar with the case but do not fully know the details. If this is the case they can participate like anyone else. If however they do know the details you can still use them. One method I learned was to have them be the antagonist of the group who disagrees with decisions. This helps build strength of character as the group defends their decisions. It also helps cops learn to debate and have a discourse without wanting to destroy one another, although the facilitator must monitor closely, as I have seen things get heated from time to time. Bruce offers some recommendations for using a case familiar to participants he utilizes in his work as the Director of The Case Method Project, Marine Corps University. The classic technique for reducing the chances that any given student will know the historical outcome of a case is to base cases on relatively obscure events. In 1876, Julius von Verdy du Vernois published a series of cases that was based on a battle fought ten years earlier. Had he chosen to base his cases on the most famous battle of 1866, the battle of Königgrätz, many of his readers would have known a great deal about it. That is, every schoolboy of the time would have known who had won the battle, and most military professionals would have had detailed knowledge of the different phases of that great event. To avoid this, Verdy based his cases on the battle of Custozza, a battle from the frequently forgotten Italo-Austrian War of 1866 that had received very little attention in the military press. Should this first line of defense fail, and the case teacher find himself faced with a student who already possesses detailed knowledge of the historical solution to a case, the best thing to do is to ask the student to refrain from sharing that knowledge until after the case has been properly discussed. At that point, the teacher may want to take advantage of the student’s special knowledge by asking him to describe the historical solution. Indeed, the prospect of serving as an expert witness at the end of a class will provide the student with an incentive to keep his special knowledge to himself during the case discussion.